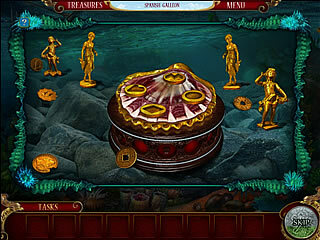 It seems that the producers the two Diana Salinger games (10 Days Under The Sea & 10 Days To Save The World) that occurred to be rather average managed to make a step up creating a new game called The Curse of the Ring. The story is about Isabel whose trip to Barbados turned out to be a real dramatic adventure after her visit to an antique shop. The girl couldn't stand buying a glorious ring and it happened so that it was a cursed one. As a result Isabel's life is jeopardized up to the moment she tracks down a bunch of pirate treasures (what have you expected, if you already know that everything is happening in the Caribbeans? The pirates, of course!). And what is worth she has only 7 days to succeed. The journey that you'll share with Isabel is fascinating but what impressed me the most was the fact that Isabel got through all that without getting her skimpy white dress dirty. 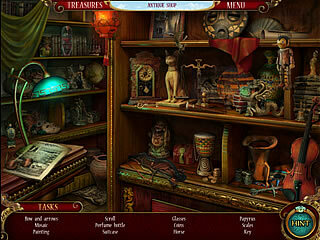 The Curse of the Ring is a classic hidden object game with some puzzles included. To tell the truth there is nothing extraordinary so if you're looking for the unique HOG experience, that's not for you. But the game is solid. The game plot is nice and the gameplay is rather captivating. As it was noticed before the Fly Wheel Games did a good job. 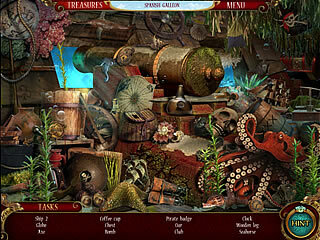 You'll have to visit lots of locations and even scuba dive to explore a pirate ship. And there you'll have to look for the items according to the list. Some of the items that are needed to be found will be lying around in plain sight, while others might be placed within hidden object levels that you can zoom in on from the main environment. If you fail to click in the middle of the image to collect it, be sure to get a nasty ding for a misclick. Besides sometimes it happens so that when clicking one thing you end up getting something else. For those of you who is tired of sculls and other deterrent pirates' elements I have good news: there is nothing like that you'll have to search in The Curse of the Ring. To prevent you from the pointless wandering back and forth a little lock appears on an object's icon if you're currently searching the wrong room. And this is a nice thing about the helpless in general hint system. Once you click it while completing a task you can get just the task being repeated. So the hints work good within the confines of a hidden object level and are useless anywhere else. As for the puzzles, they include assembling the things (you'll have to prepare your scuba tank yourself for example), shuffling tiles until two color groups switch position, reassembling pictures by sliding rings around, putting gears etc. They are not really challenging and rather well-known. And if you're not interested in solving the puzzles, you may just skip them. The journey that you'll share with Isabel is fascinating but what impressed me the most was the fact that Isabel got through all that without getting her skimpy white dress dirty. I wish everyone could do so well when he is in a danger! Though not particularly difficult or highly charged, the games graphics are so beautiful and vibrant with relaxing beautiful music, that The Curse of the Ring is very enjoyable in general. This is The Curse of the Ring review. Download this game here.